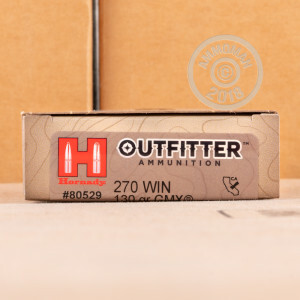 This 270 Win cartridge by Hornady features the 130 grain GMX projectile. This bullet’s defining feature is its monolithic construction -- because it is wholly made of copper alloy you may not only freely enjoy it in the state of California, but also substantially limit the amount of fouling that your bore incurs as well. Furthermore, because the GMX doesn’t have a core and jacket that are capable of separating, it retains no less than 95 percent of its weight as it expands up to 1.5 times its original diameter. The GMX is also highly accurate. Its polymer tip doesn’t just act to initiate rapid expansion upon impact, but also streamlines its long and sleek profile. 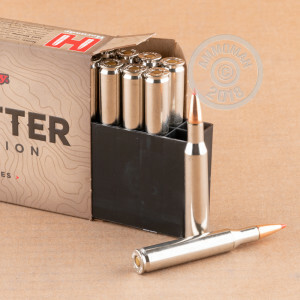 This bullet additionally sports pressure relieving grooves to bolster its accuracy. 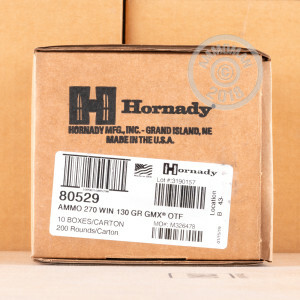 Hornady’s Outfitter line of ammunition is perfect for hunters who’d never miss a shot at their quarry because of inclement weather. This cartridge’s brass casing is plated with nickel, so it not only feeds smooth as syrup but resists corrosion too. Furthermore, this round’s mouth and primer are waterproofed to immunize them from rain and humidity. Nothing quite like lugging a bunch of hunting gear around on a humid day!